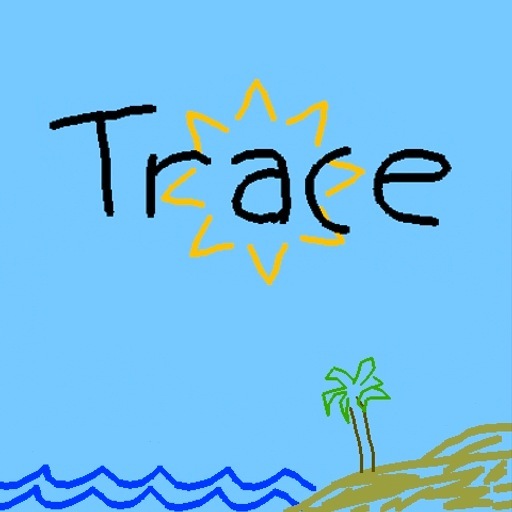 Gomi comes from the creative mind of Kevin Calderone (Bovinedragon) the maker of the great free game Trace. 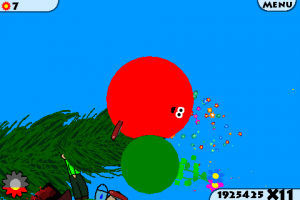 When you first look at Gomi you see a red ball that rolls around by tilting the iPhone so you instinctively think of a cheap knock off of Rolando. Well you thought wrong, Gomi is a brand new creative game that only shares the rolling mechanic with Rolando. Gomi is more like a 2D Super Mario Galaxy where Gomi jumps between platforms, and the new areas pull him in with their gravitational pull. Gomi is also a little like Katamari as he rolls he eats up bigger and bigger items. Overall Gomi is a rolling recycling unit as he moves about the area he eats up all the man-made items, and leaves flowers and trees in his wake. This is an extremely green game in that Gomi is cleaning up the world of all its trash and bringing back the natural ecosystem. 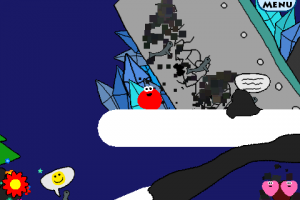 Gomi is an extremely deluxe platformer with eight different worlds to clean up. Each world has four levels and one boss battle. Each level has three stages that vary between five types of gameplay mechanics: collect, big eat, race, time, and free play. In collect mode you have to collect a certain number of items specific for the area you’re in like 50 camping supplies in the forest level, or 100 soda cans at the beach. In big eat mode there will be some big items you have to eat, so you will need to eat small things, and work your way up until you’re big enough to eat the hotel lobby or the supermarket. For race mode you have to follow the flower over five locations. In time mode you have two minutes to eat as much as you possibly can. Finally in free play you just try to eat up everything in the entire level. For every mode except race mode you’re score is based on your chain multiplier, so your goal is to eat items consecutively. Another great feature is the deluxe achievements for each level. There are achievements for level score, time, and chain bonus. Also there are online high scores for every level in the game plus the minigames. Your Gomi can be customized as well from changing the color to changing its shape. Also included are eight minigames that you unlock as you complete the worlds. The minigames are quite deluxe especially to be included in a platformer. The minigames share gameplay mechanics with Bejeweled, Tetris, Sneezies, and Pachinko. 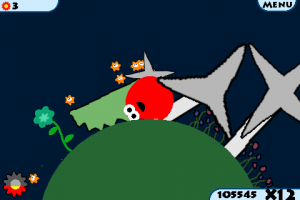 You tilt the iPhone to control gomi, and tap anywhere for him to jump. To transport between the areas there are geysers on the levels to shoot him all across the play area. As you progress you also pick up special abilities (eight in total) including super size, speed burst, no gravity, and create a geyser. To invoke the special ability you tap on gomi. Gameplay is king for Gomi. This game may have the most fun and engaging gameplay in the App Store. 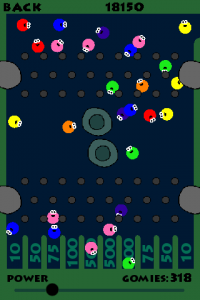 It is super fun and addicting rolling Gomi around and collecting bigger and bigger items while trying to keep your chain alive and jumping high enough to reach the next area. There is plenty of difficulty as you need to reach certain areas to eat small items to go back to other areas and eat the big items. All the time maintaining your chain, and achieving a time bonus. The boss stages are simply outstanding and provide unique challenges including putting out a forest fire, cleaning up an oil spill, and eating up an entire factory. Every boss level can only be beaten using the special ability for that world. The entire time Gomi is so cute and sweet while he’s either smiling or in surprise when he jumps. Gomi is my new favorite character in any iPhone game. The music included is absolutely outstanding and wonderfully in tune with the premise of the game. There are a few different deluxe songs that are mellow & relaxing and varied enough to never feel repetitive. The sound effects are practically non-existent, with only a spring as Gomi jumps, but nothing when he’s eating up the items. Replayability isn’t even a question mark with so much to do. If you beat every single stage in the game there at least 12 hours to play, and that’s if you don’t even replay a level to better your score or go for more achievements. The minigames add even more reason to continue to play in Gomi rather than going to another game. 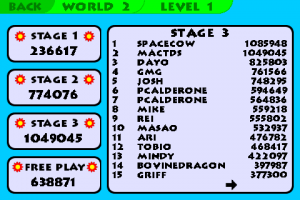 The online high scores for every level are outstanding, and check mactds (I hear he’s on there a lot). The achievements are difficult to attain, and you won’t get many just playing through once. The visuals don’t have the polish of Rolando 2, but are all hand-drawn and detailed wonderfully. Everything in the game is cute, and the hand drawn quality adds to the overall game helping it stand apart. It’s great to see the items shrink into gomi, and flowers and trees spring to life behind him. 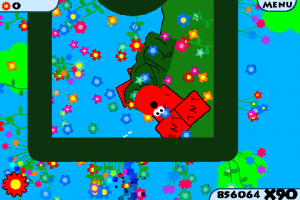 When you complete a level there is an explosion of flowers around Gomi. All of the items are simple, but cute. 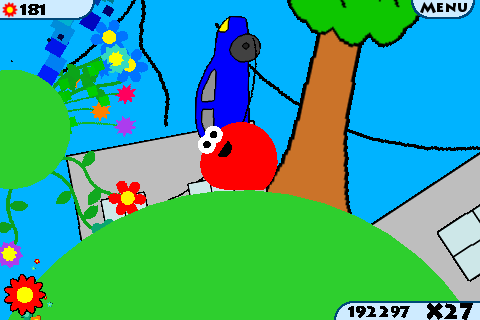 From the cars as simple blobs with wheels and the buildings with square windows and doors to the little things like the smiley balloons and beavers with construction hats. I love this game, and didn’t find any problems with it. You may be turned off by the visual style, but I enjoyed it. The one problem, though it’s more of a suggestion, is that Gomi can hopefully rolls just a little bit faster, a quarter turn quicker. He just seems to roll so slowly when you’re trying to continue your chain bonus.